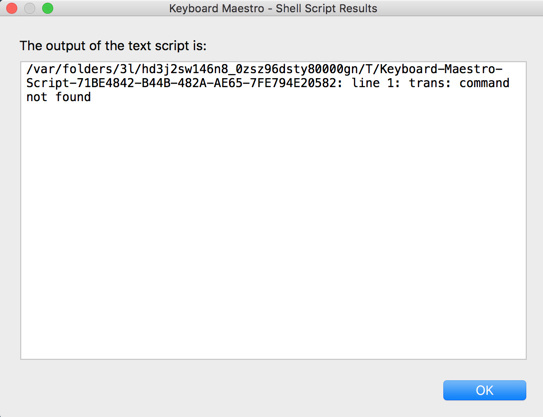 This macro is a GUI wrapper the the excellent Translate Shell script by Mort Yao. The great thing with Translate Shell is that it works with many different translation engines, for example Google, Bing, Yandex and —since a couple of days— also with the fine DeepL engine. You get all in one, without the need for different scripts. The Translate Shell script works perfectly fine in the Terminal, so this macro is really just a “convenience” macro that provides a bit more comfort. 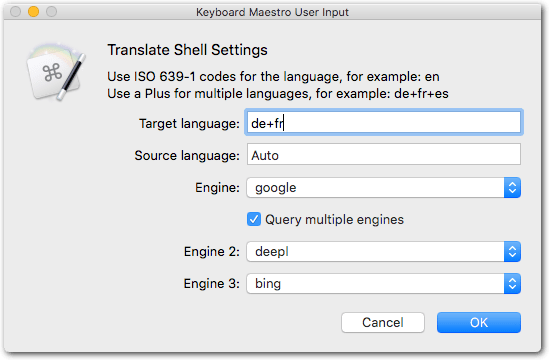 You can query up to three translation engines simultaneously. You can query translations to different target languages simultaneously. Optionally you can choose the target language from a quick list prompt. This macro covers only the main use-case, that is, translating junks of text. 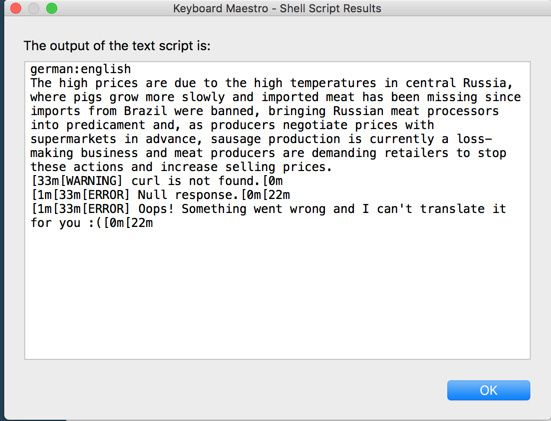 Translate Shell has many more little great features that are not accessible through the macro, and some of them are designed to be run in the Terminal. It is really worth to read through the documentation on GitHub! The --HEAD switch installs the most recent version, which currently (2017-12-16) is the only one that includes the DeepL engine. To install the “stable” release just omit that switch. Select the text to translate in your word processor or text editor. If nothing is selected the clipboard content will be used. Launch the macro from the Global palette. The translations will be displayed in one or more KM windows. I think the prompt is pretty much self-explanatory. Source language: In most cases “Auto” is fine. Engine: This is the only setting you have to set. Engine 2, Engine 3: Additional engines to query. The results of each engine will be displayed in a separate window. To disable the additional engines set them to “None” or just deselect the checkbox. After the first run (and you have selected an engine) the Settings prompt will not appear again. To bring up the Settings prompt again launch the macro with the Command (⌘) key pressed. Make sure the ENV_PATH variable is correctly set in KM. When using the DeepL engine there seem to be encoding issues on the Mac, no matter how the LANG variable is set. Note that this is only necessary if you are using DeepL and you are dealing with non-ASCII chars (that is, translating to other languages than English). Google and the other engines work fine without it. This is meant as a temporary workaround until the issue gets solved by Translate Shell itself. In the section “Issues & Troubleshooting” of the post above I have mentioned a Perl workaround to make the Translate Shell script work correctly with non-ASCII chars from the DeepL engine. If you prefer not to install bash 4 you can of course still use the Perl fix as shown in the post above. Tom, as you know I am a shell scripting / bash neophyte (not even that good). I don't need your Translate Shell stuff, but should I upgrade to bash 4 anyway? If so, does it completely replace the current version? Is there anything special I need to do after the upgrade? As always, thanks for your valuable guidance. I don’t now. The relevant stuff in the case here is a better/different Unicode handling by bash 4, told me the author of Translate Shell. Besides that I have no clue what the major differences are. I also worked with bash 3 till now. If so, does it completely replace the current version? Is there anything special I need to do after the upgrade? Hombrew says, for full usage in the interactive shell the path of bash 4 should be added to /etc/shells. I think this is a security thingy. As long as you have set your Terminal to use the default login shell (see screenshot below) and /usr/local/bin is on your PATH it will be used by the Terminal automatically. Similar of course for KM: /usr/local/bin must be in your ENV_PATH variable. But I guess it is there already, otherwise KM would not find any of your Homebrew-installed tools. Your macro using Deepl seems very interesting and exactly what I was looking for. concerning Bash, where do you recommend I install it from. Is there any way that Bash can mess up my Mac or create a security risk ? I appended the highlighted section below to the execute shell script action of the macro. Did I append it at the right place in the right action? the question is not if you have installed Bash (every Mac has it), it’s rather about Bash 4.
concerning Bash, where do you recommend I install it from. Is there any way that Bash can mess up my Mac or create a security risk ? Have you seen my reply to JM? Seems correct. But the workaround with the Perl script was before I learned that the new version of Translate Shell will work correctly if Bash 4 is used. In other words: if you’re going to install Bash 4 you don’t need the Perl appendix. According to your other screenshot (“line 1: trans: command not found”) I rather have the impression that you didn’t install Translate Shell at all (or the path is not known to KM). thank you Tom for your answer. Each of the steps is explained in the posts above. Don’t hesitate to ask, if something is unclear in my explanations. Two of these things — ① learning to use Homebrew (or another package manager) and ② setting up ENV_PATH — are also pretty much required for any other KM macros that make use of non-standard command line tools. So, even if at the end you don’t use this macro, you’ll have done the necessary preparations to use other shell script macros. thanks very much.. I will try it out. You are very patient. Thanks ! I installed Translate Shell and Bash 4. I added ENV_PATH to my KBM variables. When I gave ENV_PATH a value of /usr/local/bin/trans as per your message, the macro output did not contain useful translation info. 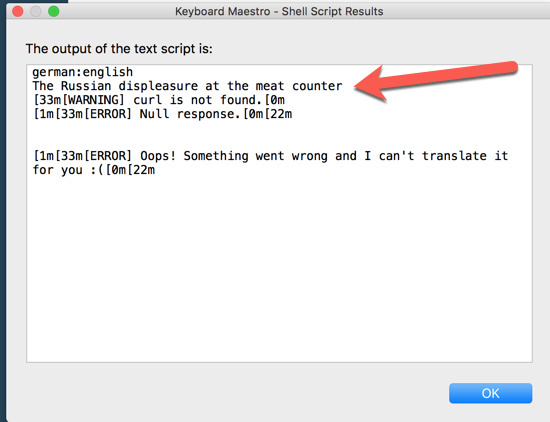 When I gave ENV-PATH the value /usr/local/bin:/usr/bin:/bin:/usr/sbin:/sbin which I found in the link 'appropriately' (Make sure your “ENV_PATH” KM variable is set appropriately ) in your reply, the output contains the translation (which reads The russian displeasure at the meat counter) as per below but also extra lines of error messages. Just for the sake of completeness; yours should work also. The output from the screenshots you posted makes me think that this is the output as intended for the Terminal. (The output for the Terminal contains coloring informations and such.) My macro attempts to avoid the Terminal-specific output by using the -brief switch in the shell script actions. Please make sure that that switch is still there in your shell script actions. Or just re-download the macro in case of doubt. Well, basically it works now! Just some minor hurdles! yes, thanks very much for your patience. Something that occurs to me now: maybe it needs gawk (GNU-awk). This depends on the engine you choose. Google usually is faster than DeepL. You can choose the engine by holding down ⌘ while selecting the macro from the palette. In any case: any speed issue is not an issue we can resolve on our side. The deciding factor is the time the engine needs to deliver the results (including connection speeds). The time consumed by the shell script or by the macro is negligible. Thanks for the GUI wrapper and the hints, I made it work in a version for me, but DeepL shortens the text to a paragraph, is that happening for everyone, or is there something missing/wrong?